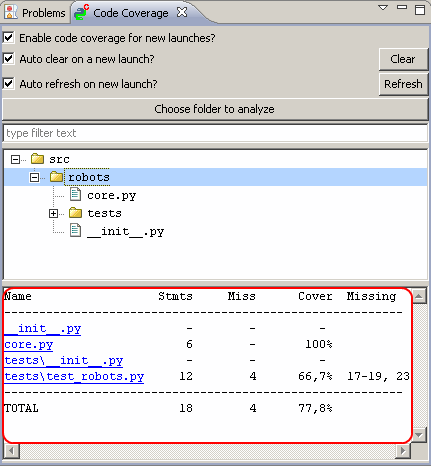 To use the code coverage integration in PyDev, the coverage module is needed. It may be gotten from: http://pypi.python.org/pypi/coverage (the integration is tested with version 3.4, so, this is the recommended version). After installing it (which may be done through easy_install coverage), don't forget to refresh your interpreter configuration so that the coverage module is properly recognized by PyDev. 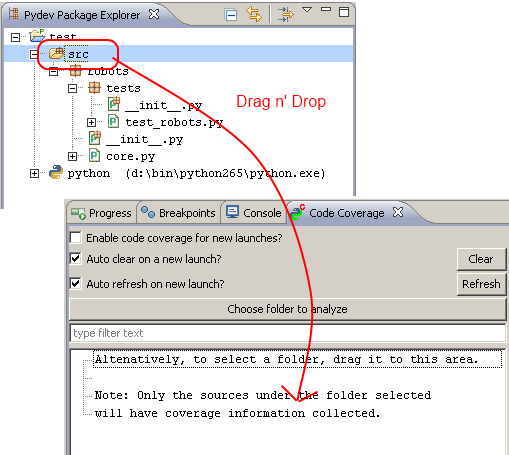 Then, drag the folder which should have coverage info obtained and drop it over the code coverage view. 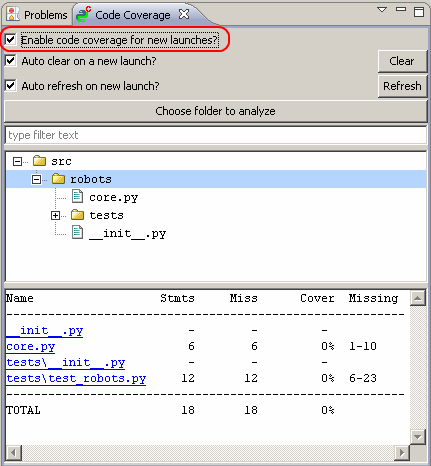 Check the 'enable code coverage for new launches' (after this step, any launch, regular or unit-test, will be launched with flags so that code coverage information is obtained). Then, do a new launch and inspect the new coverage results (clicking on the link will open an editor that allows opening the file with markers indicating the lines that weren't executed – note that editing the file or closing it will remove those markers, but you can always click on the link again to see them, although they may already be unsynchronized at that point).